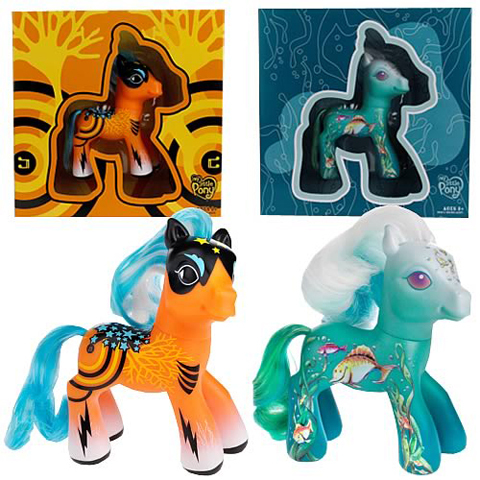 After all, something new is coming up by Hasbro, that is not ugly and uncreative G4, but a new Collector’s Pony designed by Mizuno Junko, that is simply gorgeous. 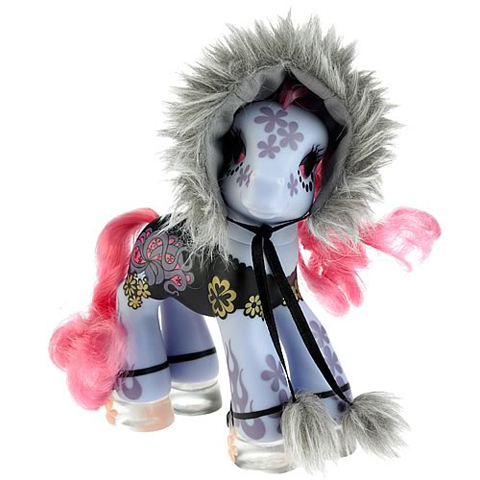 It lacks her normal disposition to combine scary and cute elements, so what we get is a mere cute Pony and I really want to have it on display in my showcase…or perhaps above my computer table, so I can see it while designing myself!? XD You can pre-order at entertainment earth. Look at the bird on the back foot, cute! I don’t like those two very much, the eyes are a bit creepy! 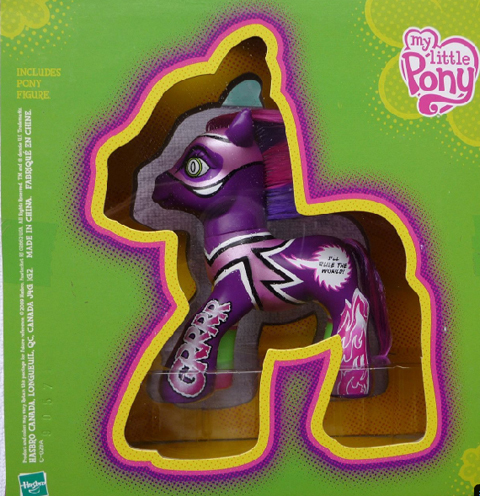 Teh so called Peacock Pony is beautiful, but I feel it’s a bit annyoing all ponies are in that same Core 7 pose. 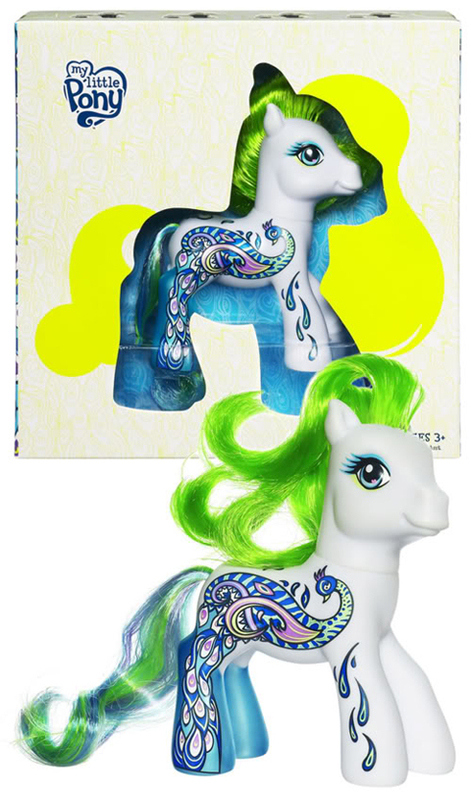 Those two pictures show the right and left side of this years Comic Con Pony. Now that I take a closer look I have to admit there’s one creepy eye, too, but still: it rocks! I’m a bit angry those don’t seem to arrive in time (normally it’s two days from here to France). Of course I loved it, it’s sooo beautiful! Genial, was es nicht alles gibt und das Neuseste ist definitiv das Genialste! das sind wirklich ganz toll bemalte ponies, ich bin ganz hin und weg. wie kann man denn an diese tollte collection drankommen? Ich war in meiner kindheit ein großer MLP fan und hatte so einiges, die ich immernoch habe. Ich bin zwar nicht mehr in dem alter das ich damit spielen würde aber als samelobjekte sind die neuen ponies geradezu gemacht worden. 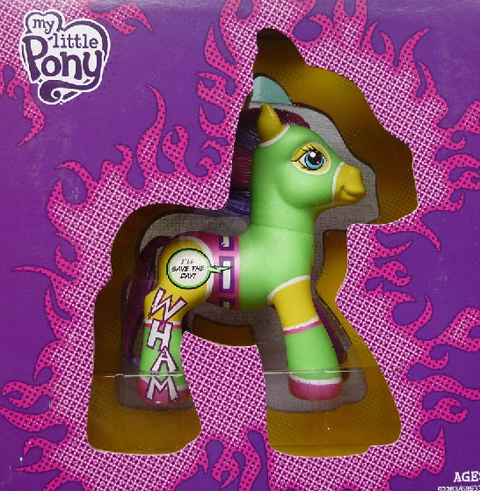 Ich finde es echt toll das Hasbro die MLP nochmal zum leben erweckt haben, sie waren glaub ich ein ganzes jahrzehnt aus den geschäften verschwunden. Ich wünschte ich hätte schon kinder oder nichten, da würde ich meinen kram wieder ganz schnell aus dem keller kramen. Sei Gegrüsst. Guter Artikel, ich habe mir mal deinen Blog abonniert.